Insight Editions has published a hardback book titled The Vampire Diaries: Unlocking the Secrets of Mystic Falls which released on September 12th 2017 at numerous online retailers and high street book stores. Does Unlocking the Secrets of Mystic Falls deliver what it sets out to in the form of producing an ultimate companion for the collective 8 seasons of The Vampire Diaries television series? When The Vampire Diaries began airing on ITV2 in the UK in 2009; I had no idea who was starring in the series, how many episodes and seasons the series would last for, that it was based upon popular novels or if I would even like it. I just gave it a chance because I thought it must be worthy viewing from the perspective of ITV2 which had dropped Supernatural to replace it with The Vampire Diaries. Eight years after I started watching The Vampire Diaries; I can look back and appreciate Julie Plec’s and Kevin Williamson’s fine work on creating a show that actually gave me a lot. Within 9 episodes of the first season, I had a new favourite actress in the form of Nina Dobrev to root for in happiness and success. I can also honestly say that The Vampire Diaries helped me through one of my most difficult days when I believe a lifelong dream was unfairly crushed and while that is a story for another day; the entire point is that a well written TV series with world class acting performances from your favourite actress as part of a great ensemble cast lasting 42 minutes per episode can encapsulate the mind in a powerfully therapeutic way that can never truly be underestimated. I had never felt the same way about a TV series since Buffy the Vampire Slayer, but out of nowhere came something that bettered it by delving just as deep into each and every character from Katerina Petrova in 1492 Bulgaria to the origins of the Mikaelson family and everything in-between. It made me excited when I heard about The Vampire Diaries: Unlocking the Secrets of Mystic Falls hardback was releasing as it feels like the beginning of a trip down memory lane. The Vampire Diaries: Unlocking the Secrets of Mystic Falls is in well prepared hands as it is written by Michael Mallory who is an internationally renowned expert on films, television series, animations and 20th century pop culture; having previously written 16 non-fiction books including Iwao Takamoto: My Life with a Thousand Characters, The Science Fiction Universe and Beyond: Syfy Channel Book of Sci-Fi, Marvel: The Characters and Their Universe and Universal Studios Monsters: A Legacy of Horror, while Andrea Robinson is a editor and author having written a young adult novel titled Vampire Crush which was featured in the Scholastic Book Club. The Vampire Diaries: Unlocking the Secrets of Mystic Falls has significant contributions from cast and crew including a foreword by Julie Plec and Kevin Williamson, a preface by Ian Somerhalder, and an introduction by Paul Wesley. Julie Plec’s and Kevin Williamson’s involvement goes beyond their foreword, branching into insights regarding how the books were adapted into a TV series, changes that were made to the TV series in comparison to the books and various features, while Greg Orson sheds light on finding the cast capable of bringing life to each and every character. 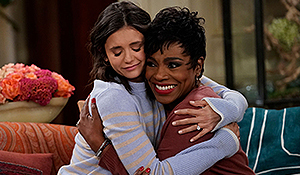 Those who did not write directly for the book have been quoted from interviews such as Nina talking to the Hollywood Reporter in 2015 and talking to the media about her experience of filming at the end of season 6. The approach taken by Unlocking the Secrets of Mystic Falls is thankfully an appropriately balanced one; providing a nod to the origins of The Vampire Diaries as a series of books written by L.J. Smith as early as the first paragraph of the opening chapter. Thereafter, the entire book is not just dedicated to each season, but also what goes on behind the scenes from the very beginning of the show until the end. It is not until the third chapter on the 85th page that coverage of each season begins. If anything, this is a positive mindset in diversity of content when constructing chapters. 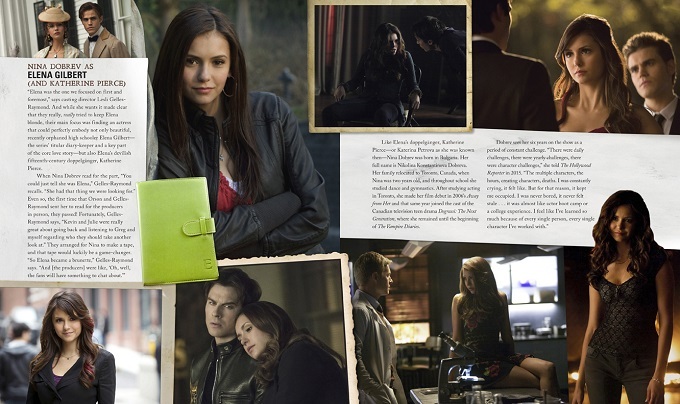 For instance, the second chapter titled Bringing the Drama to Life depicts in thorough detail what it felt like to be a story writer, multiple filming processes that gave The Vampire Diaries a distinct look and how fight scenes were captured such as Nina’s outstanding season 4 finale fight between Elena and Katherine. Elsewhere, an in-depth look into how locations are chosen in co-ordination with the aesthetic required for each scene in addition to coverage of the real world locations for the majority of recurring environments within the series such as the original Salvatore Boarding House and Wickery Bridge, constructing sets for the Salvatore Boarding House including a floor plan illustration, Mystic Falls High, Mystic Falls Grill including a food menu prop overlay and more besides. 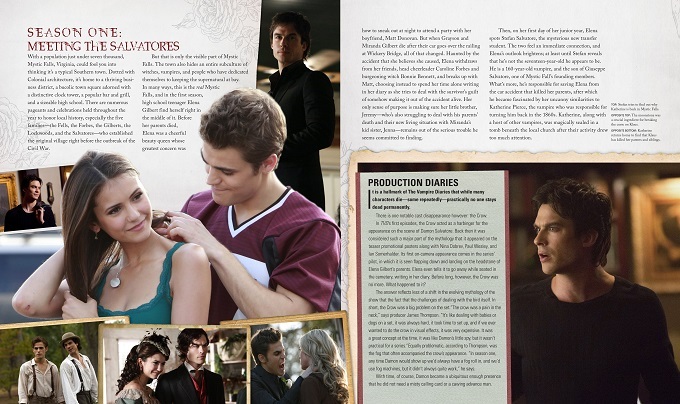 There is even a look into how the luxurious costumes were created or found that Elena, Caroline and Rebekah would wear to the period dances and special events around Mystic Falls as well as the period costumes worn by Damon, Katherine and Lexy in addition to the accompanying hair and makeup. The chapter is rounded out with finding the appropriate music to fit a dramatic, sad, action or surprising scene and the majority of the cast and crew discussing their personal favourite props, although there is no quote from Nina due to perhaps being unavailable during her busy filming and promotional schedule for recent movies. That is a lot to fit into a single chapter; yet Unlocking the Secrets of Mystic Falls has a style that always produces the correct level of detail with interesting facts from experts within that particular area of production without ever overstaying its welcome. Every major recurring character has an individual character bio including Elena and Katherine, Stefan, Damon, Bonnie, Caroline, Enzo, Matt, Jeremy, Alaric and Tyler. However, instead of just re-treading the character’s story arcs during their time on the series; Unlocking the Secrets of Mystic Falls delves deep into the actors and actresses that play their respective characters such as where they were born or where their family originates from and casting director Lesli Gelles-Raymond provides amazing insight into their casting experience including if anyone had auditioned for different roles. Later into the book, there are a further 7 character bios during analysis of season 3 which introduced the broader Mikaelson family outside of Klaus and Elijah, while season 6 provides character bios for Lily and Kai Parker and as if that is not enough; season 7 includes bios for 5 characters from the Heretics in a similar fashion to the Mikaelson family. All 8 seasons are covered individually through an overview of the story arcs within each season and emphasising particularly memorable episodes with photographs specific to that season. There are a variety of interesting side columns throughout each season such as Production Diaries with producer James Thompson recounting why Damon’s mysterious crow and fog suddenly disappeared early on in the first season, despite being initially built up as an important part of the series, neck-snapping and post-production sound effects, while Vampire Vocab outlines a glossary of vampire terminology as it was introduced within each season and Major Props showcases the significant items that appear during each season from rings, vervain and stakes to the Ascendant. Season 6’s Production Diaries column provides a factual look at the song titles that were utilised as episode titles within that season including the late, great legendary Chris Cornell’s Soundgarden songs Black Hole Sun as episode 4’s title and The Day I Tried to Live as episode 13’s title. There is also a rather thoughtful look into the shipping of character relationships and fandom during international conventions from Kat Graham, Ian Somerhalder and Julie Plec with an epilogue centred around Kevin Williamson’s and Julie Plec’s thoughts about the balancing of the final season and how they went about appropriately reaching a status of closure for everyone involved. 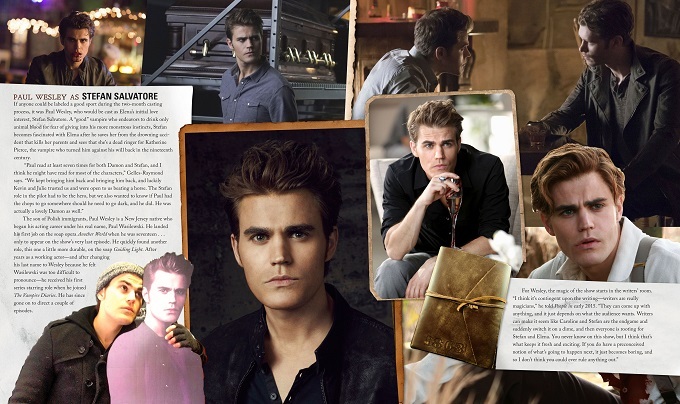 Unlocking the Secrets of Mystic Falls contains many unique features including full colour photographs of important props from pretty much every character such as Elena’s diary, ring and vervain-laced necklace; Stefan’s diary and ring; the Gilbert Compass used to track vampires during season one; Jeremy’s sketchbook; and much more besides. 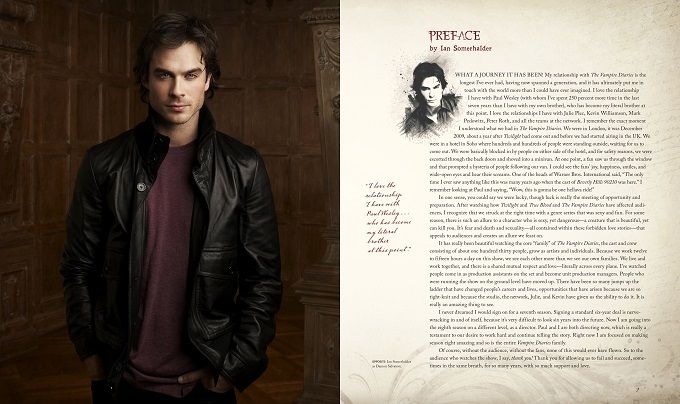 In addition to the photographs; there are also larger page overlays in the form of fair sized posters including a page from Bonnie Bennett’s ancestors’ grimoire; incredible artwork for Tyler’s werewolf transformation; a Mystic Falls Legacies booklet covers the family trees for the Gilbert, Mikaelson, Bennett, Salvatore, Forbes, Lockwood, Gemini Coven and Donovan families and bloodlines for doppelgangers; while Vampires through the Ages provides an in-depth historic timeline of when vampires were born, their movements and motivations; and an olden style photograph of Damon and Stefan Salvatore from their younger years circa 1860s Mystic Falls inside a small booklet with the Salvatore family crest on the front. 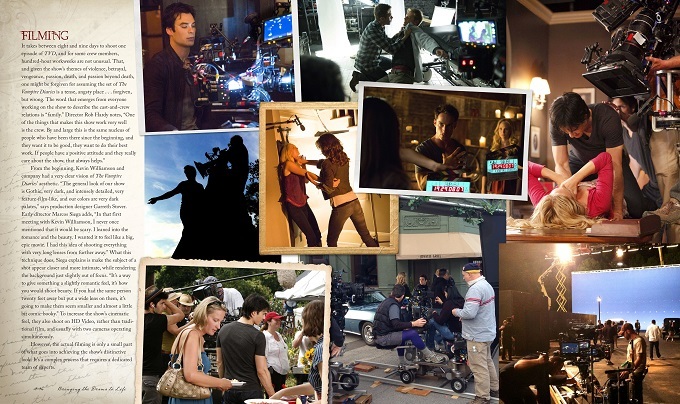 There are numerous fun stories from behind the scenes such as Marcos Siega who directed the pilot episode of The Vampire Diaries giving a speech that scared everyone into believing that if their performance was not good enough or if there was not a team bond on set, then anyone’s character could be permanently killed off; and how Nina utilised her fun sense of humour to remind him of that exact speech further down the line. As you would expect from such talented and experienced writers; the writing quality throughout the book is of a consistently high level; which is accompanied by carefully handpicked photographs chosen in perfect harmony and co-ordination with each respective chapter. The Vampire Diaries: Unlocking the Secrets of Mystic Falls is worth every penny or cent; as all 160 pages cram in as many interesting behind the scenes facts as possible and the same can be stated for the magnificent overlays and booklets, alongside beautiful presentation from the expertly crafted hardback cover to the stunning photographs and everything else in-between. Overall, The Vampire Diaries: Unlocking the Secrets of Mystic Falls is highly recommended for fans of the TV series as it delivers upon its promise of an ultimate compendium for the entire TV series from seasons 1 through 8 in a single book, while the same could be said for fans of L.J. Smith’s novels due to the intrigue of discovering how her stories were brought to life on television. Make sure not to stare at the photographs for too long, although brief gazing can be forgiven in amongst reading a genuinely entertaining book with many facts and insights from those who created the TV series. The Vampire Diaries: Unlocking the Secrets of Mystic Falls is fan service at its absolute finest and ultimate best. 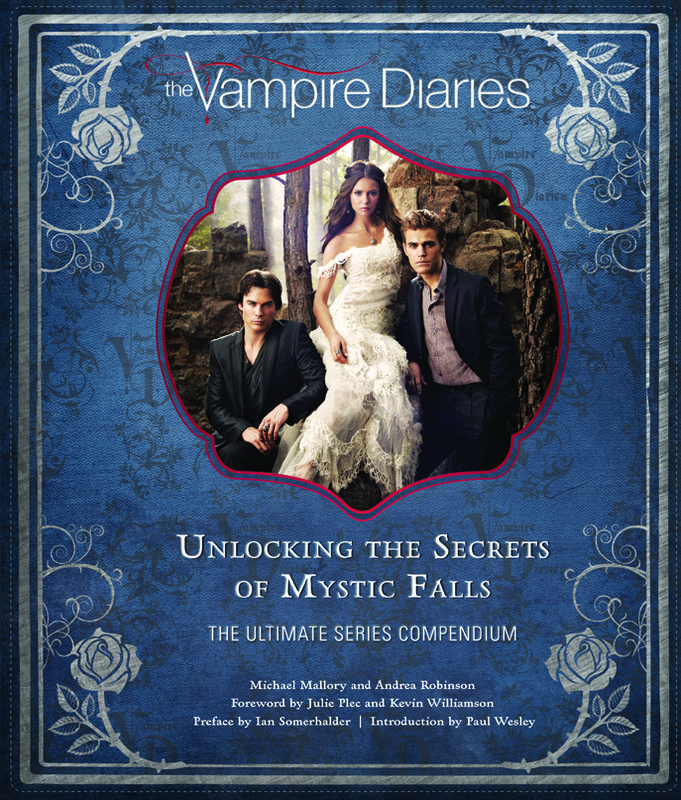 The Vampire Diaries: Unlocking the Secrets of Mystic Falls can be purchased from Amazon and Barnes & Noble. Unfortunately, Nina’s guest starring role as Katherine Pierce in Season 4: Episode 13 of The Originals has been removed from Nina’s IMDB profile. Upon first glance; this may mean it was just a wild rumour and will not be happening. However, on second glance we have technically all been here before regarding Nina’s appearance in The Vampire Diaries finale. If you recall, IMDB actually listed Nina’s appearance in the final-ever episode of The Vampire Diaries while almost everyone elsewhere was reporting that Nina would not be returning in addition to the fact that the listing specifically referred to Season 8: Episode 16 before it had even become public knowledge that the final season would be 16 episodes. There are reports that Season 4 could be the final season of The Originals due to its reduced length from 22 episodes to only 13 episodes. If Season 4 is to be the final season, then it would make sense to have Katherine Pierce or another doppelganger feature in some way to show how the Petrova bloodline would continue to evolve or for Katherine to finally get her revenge on Klaus. The involvement of a Petrova doppelganger could perhaps even lead to an important element of a spin-off series containing characters from The Vampire Diaries and The Originals. If Nina is officially confirmed for a guest starring role as Katherine Pierce or even another doppelganger in The Originals: Season 4 – Episode 13, then we should expect to hear an official announcement within the next few weeks as The Originals: Season 4 began airing on The CW on March 17th 2017. According to IMDB; Nina is rumoured to be guest starring in season 4: episode 13 of The Originals as one of Nina’s most likeable characters, Katherine Pierce, although IMDB is so confident it will happen that Nina’s appearance is not listed as a rumour. It is not confirmed if Nina will be recurring through multiple episodes of The Originals as Katherine Pierce, so it can only be assumed at this time that Katherine will play into the storyline in some capacity, although it would be nice to see Nina remaining in The Originals for a run of episodes. Some may question the legitimacy of the source given that there is no clear indication of who informed IMDB of this being 100% confirmed. However, it is important to notice that IMDB listed Nina as specifically appearing in season 8 episode 16 of The Vampire Diaries before we received 100% confirmation from elsewhere of Nina’s appearance and the additional fact of season 8 only being a 16 episode season. HQ Episode of Nina’s Upcoming Appearance on The Originals have been added to the gallery, so check them out and don’t forget to tune in Monday to catch her as “Tatia”. Dobrev says her initial response to the crossover was something to the effect of “Whoa, whoa, whoa! We’re adding another character?” but it didn’t take long for her to warm up to the idea. 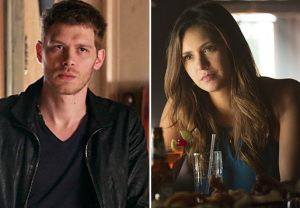 Although Morgan is quick to laugh off a “steamy” encounter between Klaus and Tatia, Dobrev hints that there might be some romantic action in store for fans. And after six years, she’s become something of an expert in that department.